Liparophyllum exaltatum is a member of the Menyanthaceae family and was previously known as Villarsia exaltata. Nymphoides is perhaps a better known member of the family and is often cultivated in ponds. L. exaltatum is commonly known as Erect Marsh Flower and is a perennial aquatic herb with an underground stem and fleshy roots. The dark green, thickish leaves are kidney-shaped, round or heart-shaped. They are held on 75 centimetre long stalks. Many flowered clusters of bright yellow flowers are held on culms (flower stalk) up to 1.3 metres long. Blooms are 4-5 lobed. The spectacular flowers appear from September to March. L. exaltatum is usually found in still or slow flowing water up to 50 centimetres deep and adapts well to life in dams, pools or containers. 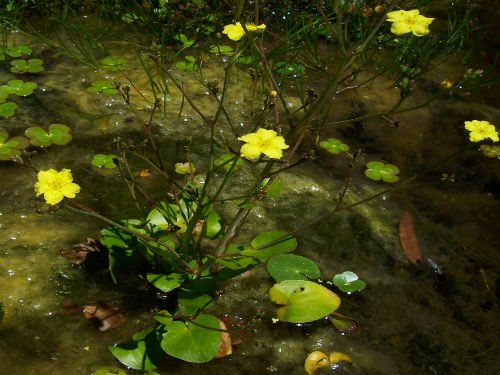 The Erect Marsh Flower occurs in South Australia, Victoria, NSW, Queensland and Tasmania. The Tasmanian population is found in the north-east and is classified as rare in that state. The species name means tall, commanding and refers to the way the flowers are held on long stalks.